It seems hardly comprehensible that one manufacturer could be producing 60,000 buses annually but that is what Yutong did last year. It is the biggest manufacturer of buses and coaches not only in China but in the world. 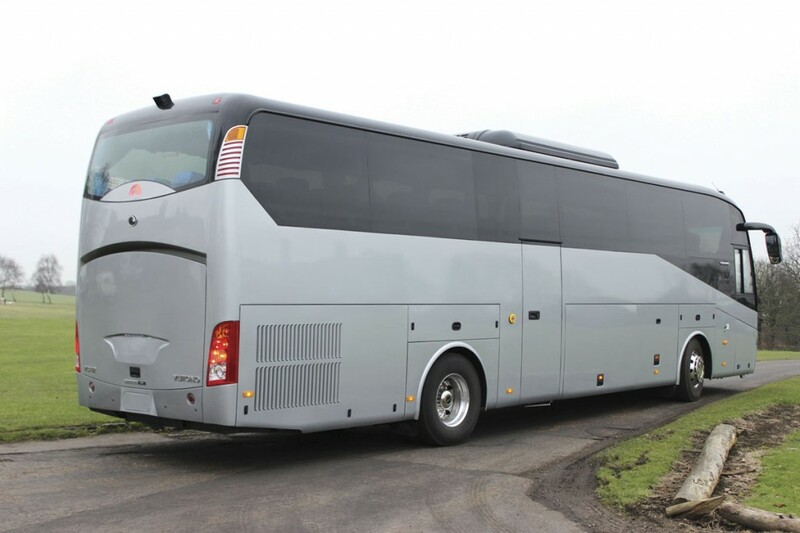 By no means all of them are big buses; they range from small minibuses to double deckers and articulated buses and encompass just about everything in between. The vast majority are supplied to the Chinese home market but export orders are increasing as the organisation looks to continue growing and also benchmark its quality. Many UK operators have been wary of buying Chinese built vehicles because of fears over quality, whether of design, materials used, or support after acquisition. 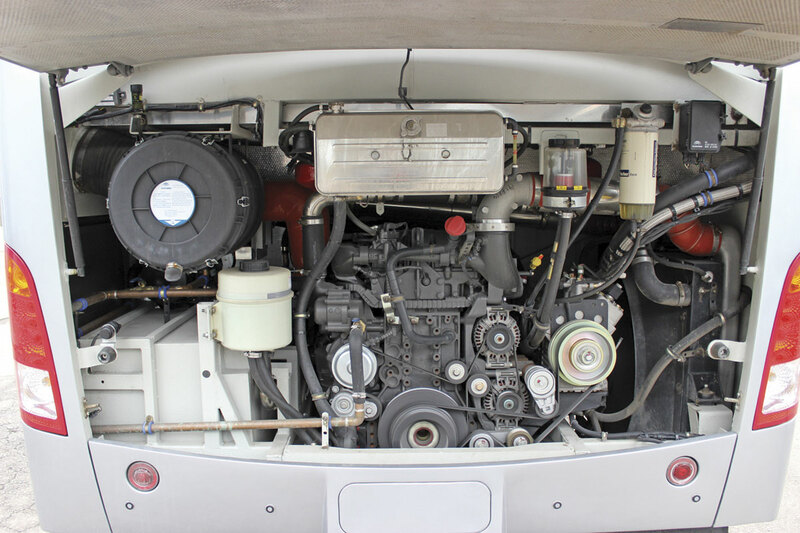 When Pelican Engineering, the Castleford based commercial vehicle distribution, service and parts organisation, took on the Yutong franchise it was aware of these concerns. It has a record of providing support in the truck industry that goes all the way back to the company’s formation in 1919 and already had a track record in rehabilitating the reputation and desirability of a poorly regarded brand in the bus sector having previously taken on the BMC marque and put in place an effective aftersales organisation for it. This continues to function although unfortunately the BMC range is no longer produced. The experience gained reiterated to the Pelican team that support was one of the most important aspects in the establishment of the Yutong brand in the UK and Ireland. For its part Yutong recognises the reservations European customers have. It is determined to be a long term player in this market and that the only way to achieve that is to supply products that meet operators’ expectations in the long term. I have twice been to the vast plant in Zhengzhou where Yutong builds its buses and coaches and on my last visit a few years ago saw first hand the investment that has gone into a state of the art research and development facility as well as two separate cataphoretic dip processes to protect the body and chassis against corrosion. Since that visit a completely new factory has been added to the enormous complex and it is here that vehicles for Europe are now constructed. To understand the needs of local markets engineers from the plant have spent time in the UK talking to operators and learning about the market as well as looking at the quality provided by established brands. At one time there were 17 engineers at Pelican’s premises and although that initial research phase is now complete, two engineers remain here providing expert back up and feeding back information to the factory on how the product is performing and can be further improved. This commitment is a token of how seriously Yutong take succeeding in the UK and is impressive when you consider that likely UK sales annually only represent a fraction of the company’s daily output. From the immense range available the first product to be offered in the UK was the 12m long TC12 coach with Euro5 Cummins ISL 400hp engine. 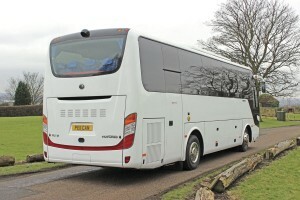 The first was delivered to Cropley Coaches last year and in total 19 have now been imported. 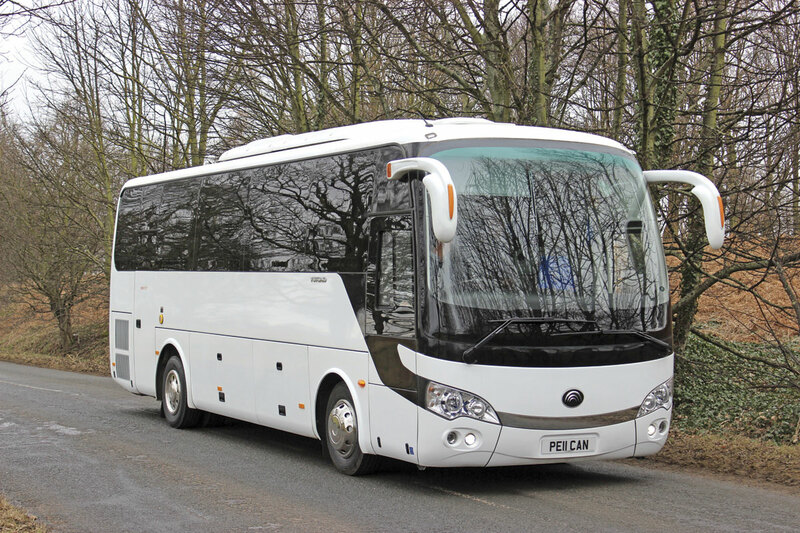 These have been successful but Yutong and Pelican have not been resting on their laurels and, as described above, have sought to incorporate lessons learned with the early examples in the new Euro6 generation products which debuted at Euro Bus Expo last year. With Euro6 TC9 and TC12 demonstration coaches now on the road, and the first Euro6 TC9s already with operators, Pelican Sales Director, Ken Grindrod, and Sales Executive, Bob Elliott, welcomed Simon Dew and I up to Castleford last week to take a look at examples of both models. 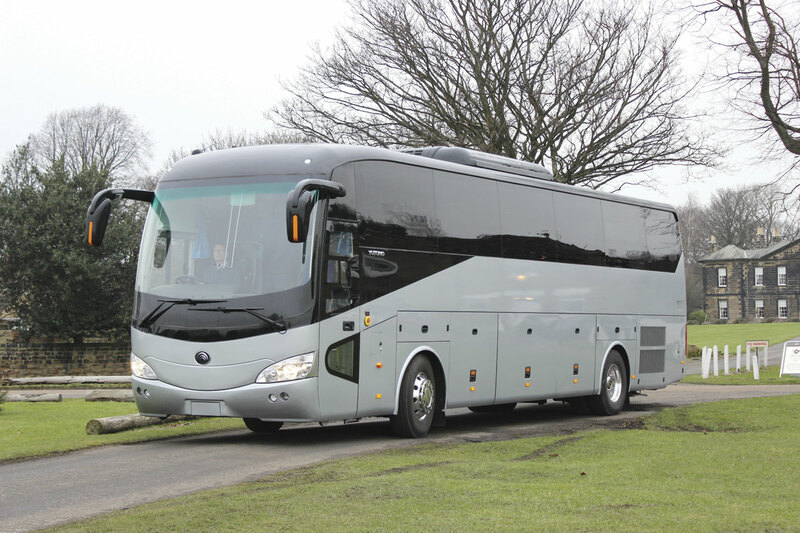 The TC9 was from the latest production batch to arrive in the UK, while the TC12 was the prototype vehicle that many readers will have seen at the Euro Bus Expo exhibition last year. 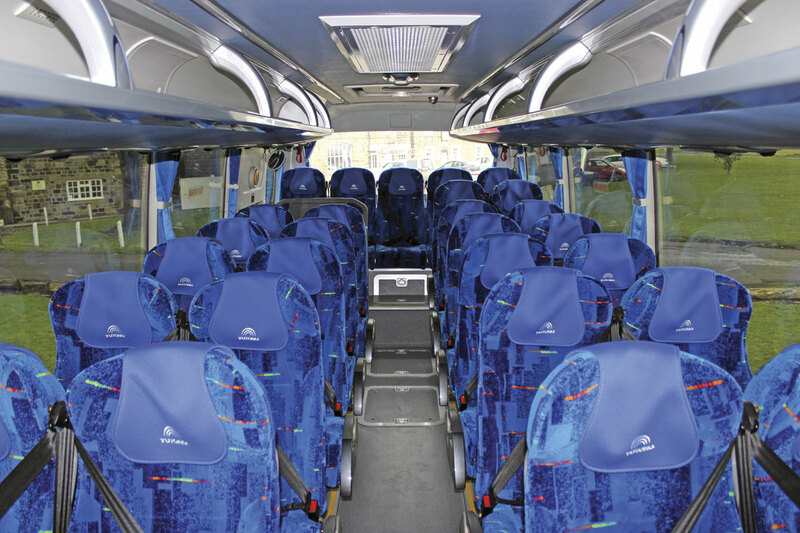 Measuring 9.35m long, 2.5m wide and with an overall height of 3,345m, the TC9 has 35 seats and a courier seat in standard format. Of full integral construction, it is mounted on 19.5-inch wheels. It is certified with a maximum GVW of 13,800kg with a 4400/9400kg front/rear split. The ULW is 10,550kg. Nominally this gives a payload of 3,250kg. The driveline has the rear-mounted 6.7-litre Cummins ISBe6.7 producing 280hp/209kW at 2,300rpm and peak torque of 1,050Nm at 1,200rpm coupled to the ZF Ecolife 6AP-1200B six-speed fully automatic transmission with integral hydraulic retarder. The axles are Yutong with a Meritor differential and the steering is the ZF8095 power assisted system. 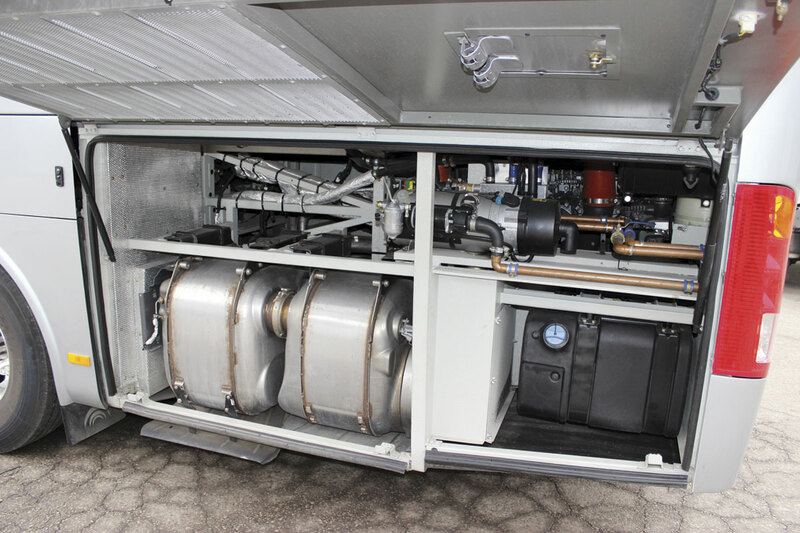 It is air suspended on both axles and has WABCO dual circuit braking with ABS and ESC. Fuel tank capacity is 250-litres. Externally it is attractive and well proportioned with a deep one piece screen, a rounded profile and more of a big coach feel than the Vario based minicoaches that have traditionally been so popular. It scores over larger truck based midicoaches in having a proper front entrance ahead of the front axle with no staircase compromises, although I did think the TC9’s was rather narrow at the top. Hand rail provision was good to the left though I found the handle on the base of the courier seat a little low to be useful. The step edges were in a contrasting yellow with inset bright blue LED lights. At the rear offside, ahead of the rearmost seat row, is a continental door with four steps from the ground up to the sunken aisle. 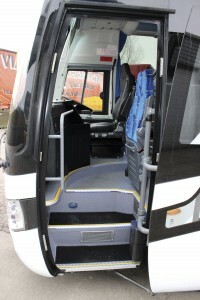 The rearmost row is mounted higher than the other seats to surmount the engine. Show visitors may well have seen the TC9 exhibited in the silver colours of AirLynx of Southampton. The interior of the coach we took out was somewhat different in that it did not have the carpet fitted that is standard on all TC9s and it had blue moquette trimmed seats rather than the e-leather in which Eastgate had retrimmed the show coach. 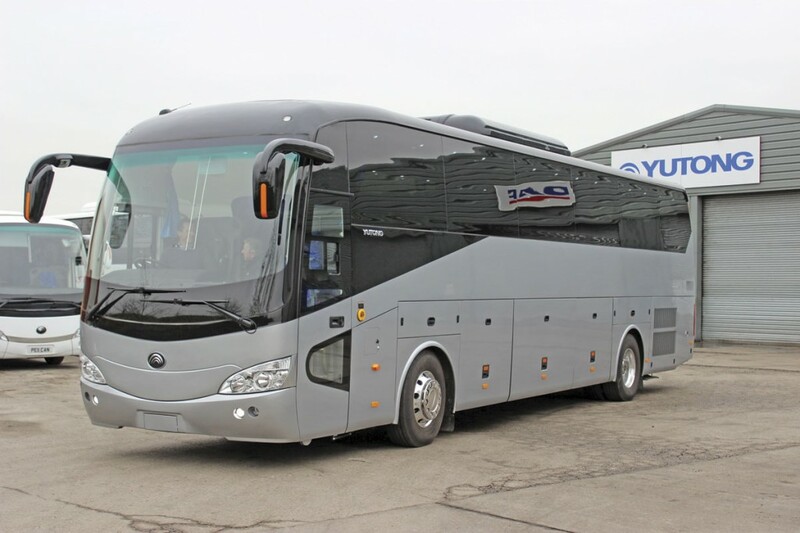 Opting to have this work carried out in the UK once the coach has arrived adds £3,500 to the £139,000 price tag of the coach and many at the NEC commented on what a high quality aura it created. AirLynx had topped this off with Sky TV and USB points. Another option is the addition of a rear saloon mounted toilet, a task undertaken in the UK by AD Systems. 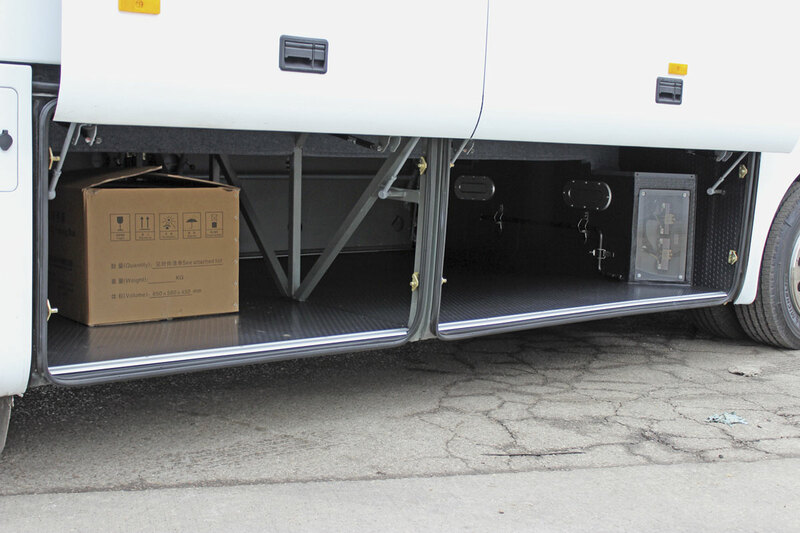 Going for the floor mounted location ensures no luggage capacity is lost but it does come at the expense of two seats, though most drop three and add in a servery in the middle of the rear row. Manufactured by Yutong, the reclining seats are full sized and I found them very comfortable with no pinching of my shoulders. 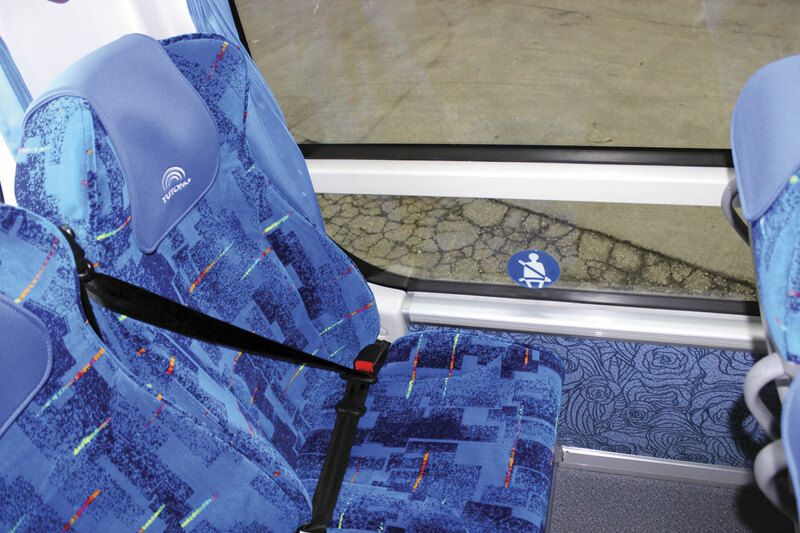 They have three-point belts with external mechanisms, adjustable aisle side armrests, a side slide facility and detachable headrest covers. Apart from the trimmed headrest the rear is a plastic moulding with two grab handles and a magazine net. The rearmost seat row does not recline but for me a bigger issue was that there is a bar across the rearmost window bay on both sides located at a height that is too high to rest your arm on and too low to get it beneath, making it uncomfortable for the passengers sat in the two rear corner seats and the penultimate nearside seat. 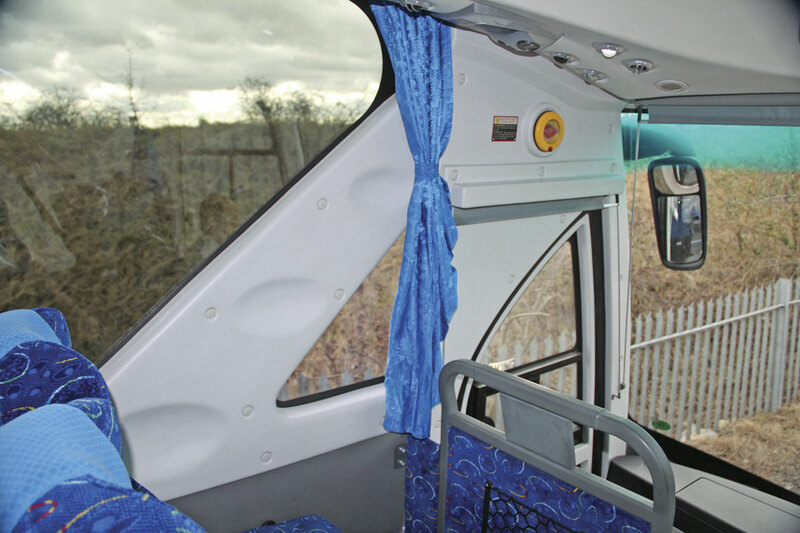 In the same area, the panel above the half height rear door is solid and has the emergency door control set in it, though it falls within the window line, consequently impeding the view for passengers. There is a small window in the upper section of the door itself but this is of limited use for sightseeing purposes as it is too low. Power points are sited on the sidewalls at every other seat row. I asked Bob whether this might not cause dissatisfaction among passengers without a socket and was told that it was quite possible to specify plugs at every seat. The coach arrives from China with the sockets neatly installed using metal finish plugs that look to be a good bit more rugged than some I have seen. A CD/DVD system and a public address system with additional wireless microphone come with every coach. 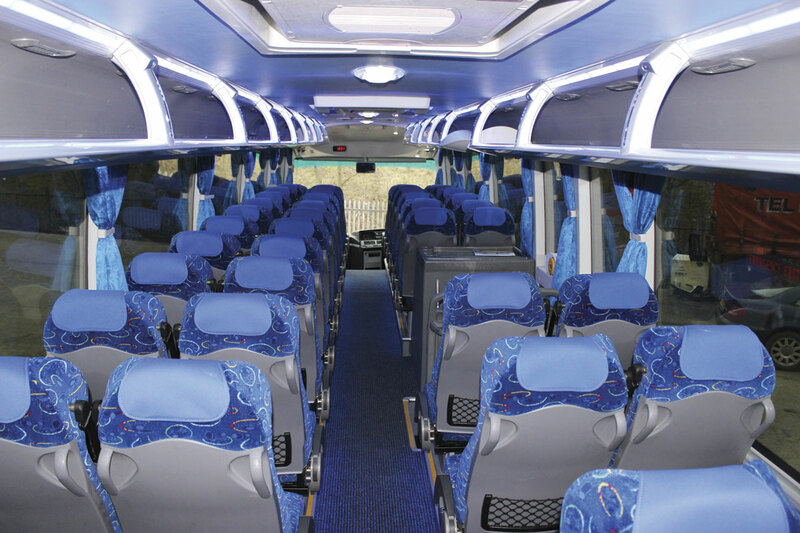 The interior is relatively simple and clean with blue patterned soft trim side panels and substantial open racks with the undersides trimmed in the same blue material as much of the ceiling. One 19inch drop down monitor is provided at the front along with small digital clock and there are enclosed roof hatches at the front and rear. Air conditioning is mounted centrally on the roof with a grille in the corresponding section of the ceiling and there is also an independent Webasto heating system. A top loading fridge is provided within the front dash, though the model is to be revised on future production. Both Simon and I were concerned about the cantilever side locker doors which have a rounded lower edge that, when open, stand proud of the body side and protrude below the upper edge of the locker space. With the comparatively low floor height and the consequentially shallow luggage compartment, these were difficult to get beneath for loading and unloading luggage. 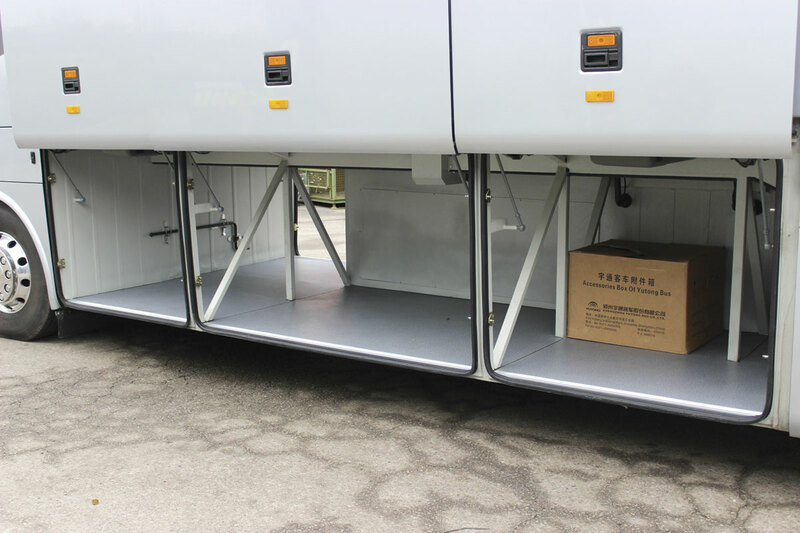 Simon would have much preferred top hinged lockers which would have maximised the aperture and Bob was able to confirm that these can be specified as an option, though not on the vehicles already in build. The five cubic metre luggage area itself is relatively free of clutter so that all of it can be used. It took a while for Simon to get the Isri driver’s seat where he was really comfortable but he got there in the end. 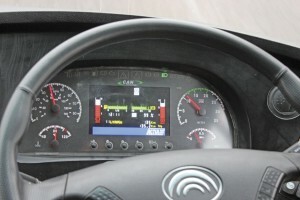 It all seemed well laid out and though the dash display was a little lacking in aesthetic style it was clear to read. The reversing camera worked well and was also clear. There was a small amount of vibration from both mirrors, but not a huge amount. No blind spots were evident on the offside but Simon found there was a small one on the nearside in which you could lose a car for a split second, though you wouldn’t lose a lorry. The steering was positive with no vibration and the lock was good as he demonstrated when we gave him less notice than he would have liked of a dog-leg turn that he might otherwise have allowed more space for. Going uphill at 60mph in sixth (top) the revs were showing just under 1,500rpm, and only slightly higher than that on the limiter at 62.5mph/100kph. Gear changes were very smooth. The brakes were progressive and the retarder worked well, though there was an obvious clunk when the retarder was knocked off going downhill. It wasn’t a windy day but the lighter nature of the TC9 meant that as a passenger you could feel a slight movement as an articulated curtainsider truck drove past, but despite this the ride characteristics were very good. Wind noise was minimal. As the coach cruised there were a few squeaks in the unladen vehicle but no rattles. Bob assured us the squeaks disappeared when the seats were occupied. It felt solid and even when under load I did not see any obvious window shimmer or shake. Sat at the rear the engine insulation was adequate and though there was a small degree of road noise coming up the open stairs of the rear continental doorway it was not intrusive and no louder than on other rear engined coaches with similar layouts. Like the TC9, the TC12 is a fully integral design, examples of which had already been sold in France and Israel (in left hand drive) prior to the model being offered in the UK. Now slightly longer at 12.28m than the exactly 12.0m Euro5 model, it is 3.8m high and 2.55m wide. 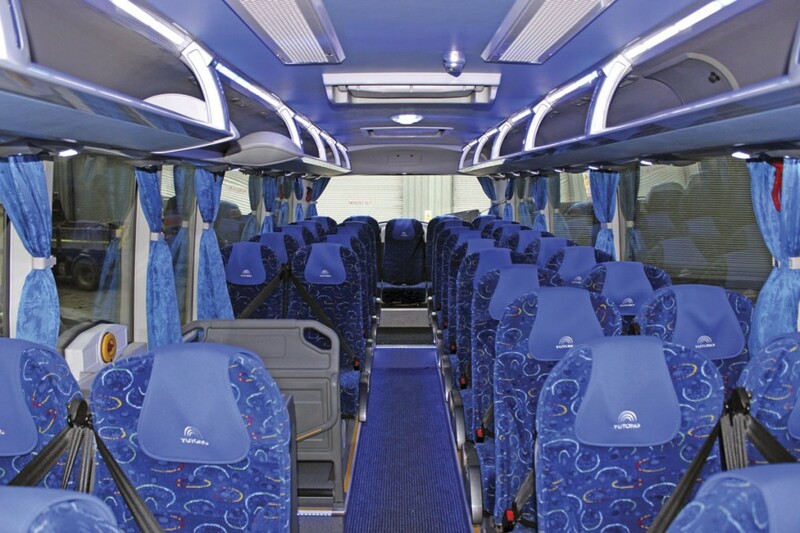 The standard specification provides 51 reclining seats and a centre continental door and toilet, though you can also specify 53 or 55 recliners and no toilet with centre and rear door arrangements respectively. Luggage capacity is eight cubic metres with a toilet in place and, nine cubic metres with the centre door and no toilet and ten cubic metres with the 55 seat rear door arrangement. Illustrative of just how quickly Yutong’s engineers can react to feedback is the number of changes introduced for the Euro6 version compared to the original coach unveiled earlier in the year. Visually distinguishing it from the Euro5 model are conventional vertical window pillars rather than the swept forward C to B pillar of the original model. 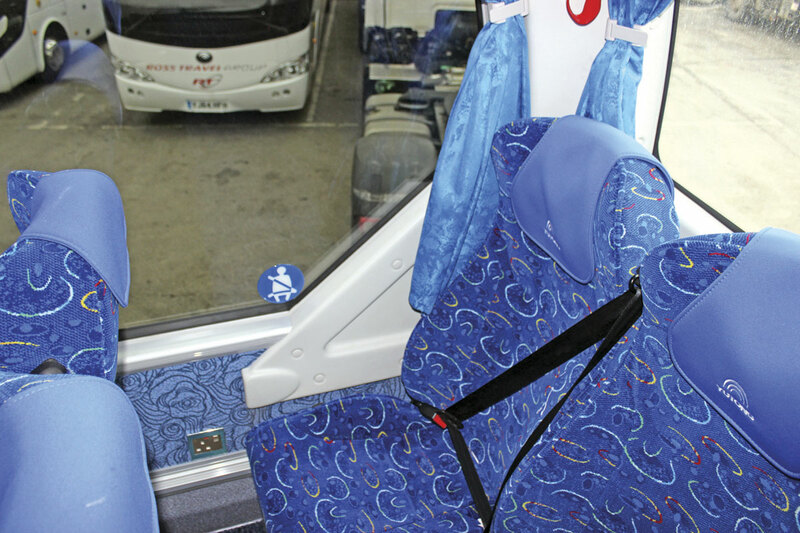 This makes coach arguably more European looking and certainly does not compromise the view of passengers sat near the front in the way that the early example did. I also noticed that the position of the second drop down monitor had been altered from above the toilet compartment to above the aisle alongside it. Other operator inspired changes include repositioning the microphone to the side pillar and the use of pleated rather than loose curtains and there are many other detail changes besides. It isn’t only the appearance that has changed; the latest version has independent front suspension rather than a beam front axle. The engine has changed too, although this was part of the plan from the outset. 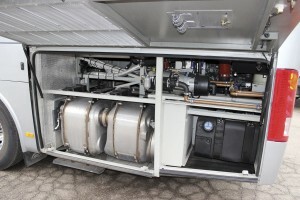 In place of the 8.9-litre Cummins ISL 400hp unit, for Euro6 it gets the 10.8-litre DAF MX11 engine developing 400bhp/291kW between 1,450 and 1,700rpm and peak torque of 1,900Nm at 1,000rpm. The transmission remains the ZF Ecolife 6AP2000BO six-speed automatic. The rear axle is from Meritor, Yutong produces the front independent system in house and ZF supply the steering gear. Suspension all round is independent and braking is by means of a dual circuit WABCO system with ABS and ASC. Tyres are Michelin XZE2+ 295/80R22.5s mounted on 22.5inch Alcoa aluminium alloy rims. Fuel tank capacity is 480-litres. The ULW weight is 13,700kg to standard specification. Inside it is bright and attractive. The grey mouldings and predominantly blue trim coordinate well, and though a few of the fittings look like they came off a Dan Dare spaceship, everything works and fits. If you are looking for things to criticise on taste you may find them, the dash isn’t as smart as some of the integral manufacturers manage, the signage could be more elegantly executed and there is a lot of plastic, some of it quite chunky especially around the doors, but most of it looks to be reasonably good quality. There are places where a more quality feel could be created relatively easily, I wasn’t particularly keen on the finish of the luggage hold interior which had some ripples or dents in the front bulkhead, but would passengers notice and criticise – I don’t think so. Overall, it doesn’t have the style of some of the market leaders, but it does have a style of its own and I think a lot of people will be perfectly happy with it providing the rest of the package performs. Like the TC9 it has sockets at every other double seat and I think these have to be alongside every seat if you are going to advertise the feature. The seats themselves are comfortable, comfier than some of the lighter weight models I have experienced elsewhere recently and the view out is good in most places. In the back row, the two outer seats do not recline and there is a degree of intrusion from the diagonal mouldings to the side. Most of the seats in the saloon are rail mounted on both the window and aisle sides, but the first two rows are floor mounted on the aisle side. 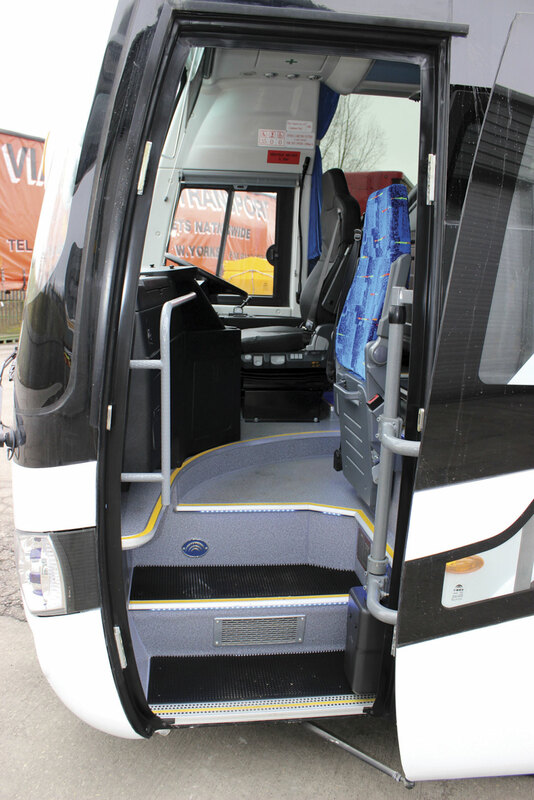 The toilet is a proper sized unit, not one built for midgets, the handrails in the five step centre entrance could be improved but there are some, and despite the height of the coach the top step does not protrude too far into the aisle. More changes to the specification are to come. The drinks servery ahead of the front nearside passengers is to be removed to increase legroom (you can still specify it), though removing it will not leave sufficient space for 53 seats and a toilet. There is plenty of space on the top of the centrally mounted non-demountable toilet compartment for a servery to be fitted if required. It is also planned that the water storage tanks will be relocated. With shipping taking six weeks from China, stock is being held with both blue and red interiors and both silver and white exteriors. And if it is really a tri-axle you are looking for, Yutong are looking at them too, though you might have to wait for around 18 months before you see one. Immediately comfortable in the cab, Simon felt it was a well planned environment with no long reaches to control functions. There was some storage space for the driver but not a great deal and not for anything bulky such as a document case. 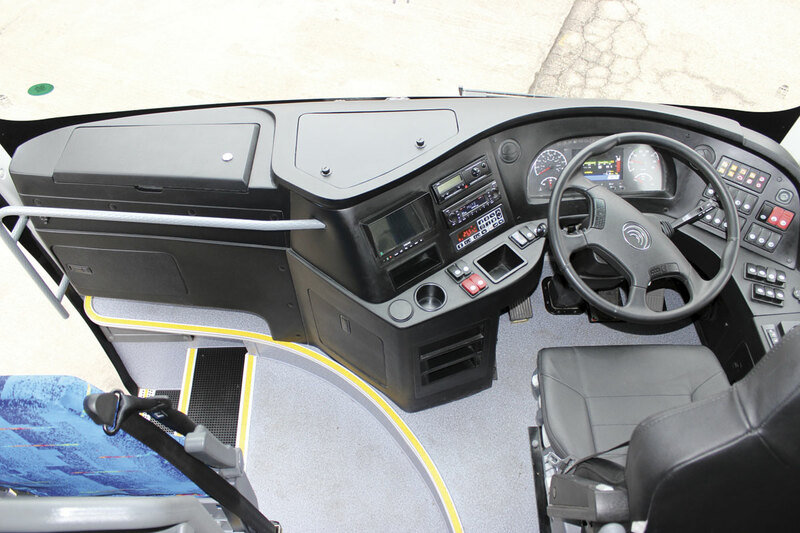 If deployed to their full extent, the overlapping front sunblinds completely obscured the nearside mirror, something that will no doubt be picked up during certification. A separate blind is provided for the driver’s side window. Once underway it was clear that, ‘it doesn’t lack power, it’s got more than enough’ though he did experience a small amount of judder through the steering wheel away from motorways. Simon thought it, ‘much more serene and planted’ than the lighter TC9 with the elements of the driveline well matched. It was commendably quiet in all conditions with little or no wind noise. On the TC12 there were no blind spots on the mirrors, which were bigger than on the TC9, though the offside one did vibrate. Simon was unsure about the mounting of the small convex mirrors below rather than above the main mirrors on the arms as he would have preferred to see lower down with the main lens. Apparently a plate has been added behind the A-pillar to enable a low down mirror to be fitted if required. Lock proved equally good with the larger coach, though this time Simon did have more notice that the dog-leg turn was coming. In such cornering manoeuvres, the presence of the servery was an obstacle to a clear view of the road. Travelling at 30mph in fourth and 40mph in fifth it was doing around 1,000rpm with the same revs recorded when in sixth at 50mph. At 60mph, also in sixth it was showing a little less than 1,250rpm and on the limiter it was on 1,250rpm. Simon liked the ability to opt for the full auto which gives a continuous flow to the drive. We were told that there are no plans to make the AS-Tronic automated manual available as an option, and why would you? Ride quality was good throughout the coach. Engine noise was not intrusive and neither were any other aspects of the driveline though there were some rattles from seats in some places. Knee room was limited in the courier seat, my right knee was pressed against the handrail when I sat in it, but there was a useful cut out for your feet. 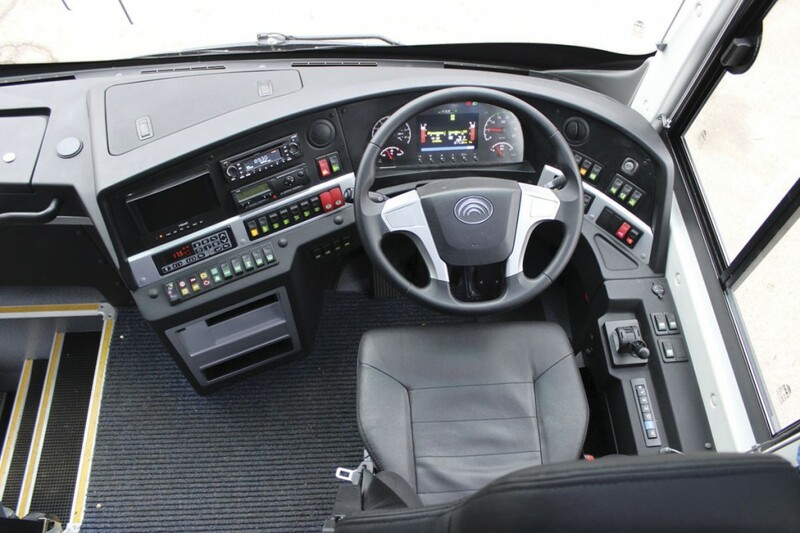 The first production Euro6 TC12 is scheduled to enter service with Cropley’s of Fosdyke, also the first customer for the Euro5 model, on 1 April. Both the TC9 and the TC12 come with two years unlimited mileage warranty and a ten year bodywork anti-corrosion warranty. Ken Grindrod stressed that, ‘we’ve got an awful lot of parts available, including glass, panels and fast moving parts, probably 99% of what we’ll ever be asked for. We’re trying to stock as many items as possible that we feel are necessary. There’s no limit on what we can order. The more coaches there are on the road, the more we’ll stock.’ He explained that all Yutong parts come from the factory but that European made components would probably be sourced more locally. Clearly what happens in the event of a breakdown is a concern for operators so Ken ran me through the procedure. It is simple. If you break down you can ring Pelican 24 hours a day. They will then arrange things and, depending where you are, either they will come out to you in one of their vans (one of which passed us when we were on the motorway) or someone working with them will go out. In Europe it depends where you are but there are dealers in France and Germany with new ones being set up in the Netherlands, Spain and Sweden. Ken also told me that when they had set up the distributorship the company had made presentations to finance companies on both Yutong and Pelican and there was now no difficulty arranging finance on Yutong vehicles through a variety of providers. 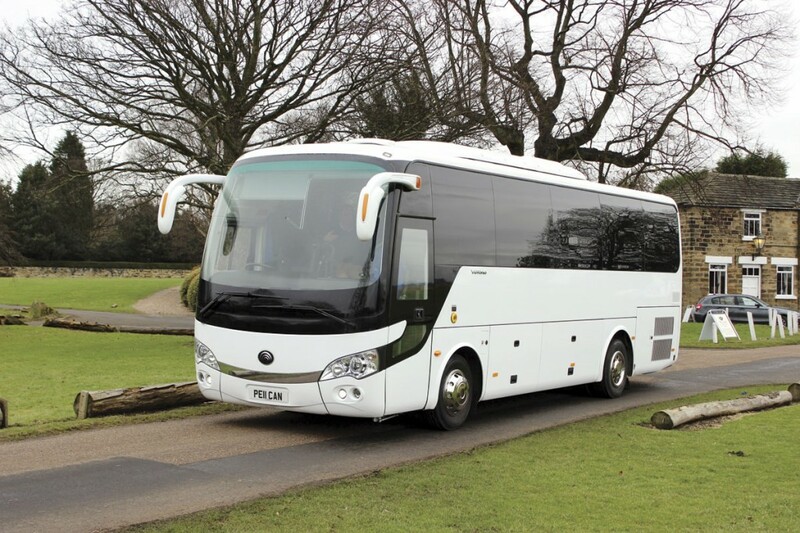 Buying a new coach is always a big decision, particularly if it is one built on the other side of the world supplied by an independent dealer, however reputable and long established they are. It isn’t a short term purchase and you need to have confidence that the promises made before purchase will continue to be honoured throughout the time that you are paying for and running the coach. Yutong are a huge concern, the investments they are making are immense, as is the number of vehicles they build, and in this respect it is a good bet that they will continue to be in existence. Pelican Engineering isn’t as big, but it is very long established and it does have an extremely good track record of providing long term support for vehicles, even ones that are not produced any more. 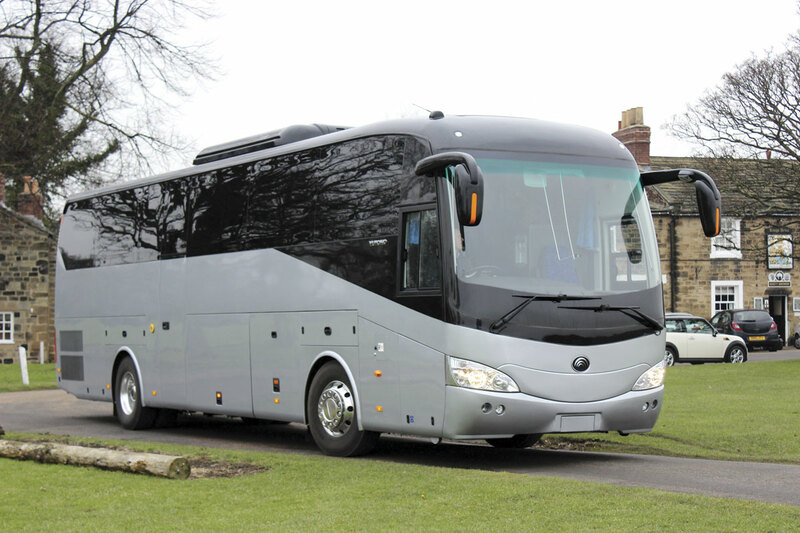 At £192,000 for the TC12 and £139,000 for the TC9, they are very competitive with other vehicles on the market, indeed you will be hard pressed to buy a similarly specified coach for these prices, though you may get a less well specified one for not very much more. Residual values are an unknown at the moment though there is an argument that they should do better in this respect than some other Chinese products have done in the past. Pelican have also worked to ensure that finance from mainstream sources should not be a difficulty. In the end it comes down in part to whether you, your customers, your drivers and your maintenance team like them and enjoy travelling in and working with them. On the basis of our brief experience of them, there is much to like about the Yutongs. Long term reliability is difficult to predict, but the DAF/Cummins/ZF componentry is reassuring and I’ve heard few complaints so far. There are some aspects of them that look clumsy to Western eyes, but less than did on the earliest examples and Yutong has shown that it intends to keep refining. They won’t stand out for all the wrong reasons in a coach park and riding on them is an enjoyable experience unlikely to generate complaints from your passengers. Having weighed these points up, an increasing number of people have opted for the Yutong, with 47 coaches already ordered when we visited. Were you to order a Euro6 now from stock build, you could realistically expect to see it on the road by April.